Chelsea manager Maurizio Sarri said he would not be leaving for Roma, after speculation in the media on Thursday. The Italian was speaking after his side beat Malmo 3-0 at Stamford Bridge to win 5-1 on aggregate and move into the Europa League last 16. 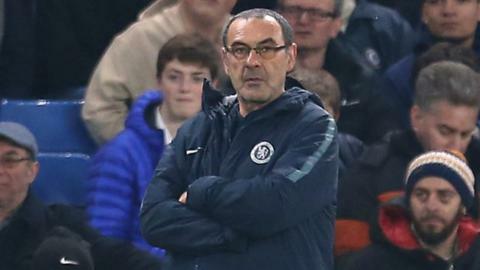 Sarri has been under pressure recently following a mixed run of results. Asked if he had been in contact with Roma, the 60-year-old said: "Of course no, I have a contract with Chelsea for next season so it is impossible." Chelsea went into Thursday's game on the back of three defeats in their previous five matches - a 4-0 loss at Bournemouth, a 6-0 thrashing at Manchester City and an FA Cup exit at the hands of Manchester United on Monday. His side face City again in the Carabao Cup final on Sunday, and then meet Tottenham in the Premier League. Sarri added: "It's very easy that City is in our minds. We played two weeks ago and now we can try to solve this problem." All of Chelsea's goals against Malmo came in the second half. Olivier Giroud scored the first from close range before Ross Barkley made it 2-0 with a free-kick from the edge of the box and teenager Callum Hudson-Odoi added a fine third in the 84th minute.